What’s the best spot for large-scale solar and wind energy sites? That is the question that Mistakes Institute explored in its 2018 report: Least Conflict Lands. The report was the conclusion of a six month project with the County of Newell and Wheatland County. The two Alberta municipalities were the test regions for developing this tool that identifies high value agriculture, ecology and cultural and scenic resources. By identifying the high value sites, solar and wind developments can be sited away from areas that have important value to residents, wildlife and businesses. 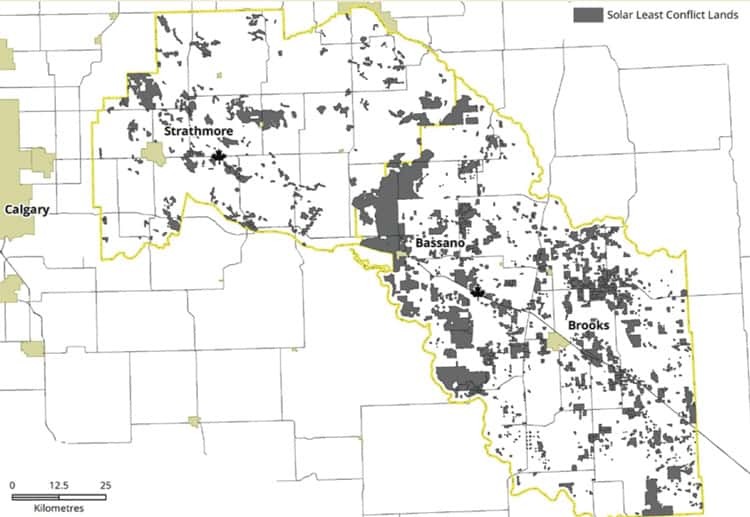 After removing the sites that prevent renewable energy development due to government regulations, it was determined that 86% of that land in Newell and Wheatland municipalities can be developed for wind or solar. The challenge was finding the sites that was optimal. This was completed by identifying regions that had significant agricultural, ecological or scenic values. After removing those lands, 15% of land in the municipalities was identified as ideal for renewable developments. The complete process to identify least conflict lands is outlined in the report. Download the complete report from the Miistakis Institute.